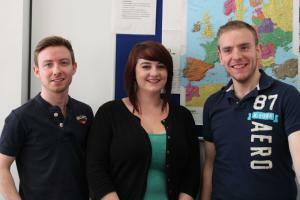 Joe West, Andrea Bishop and Andrew Bolton studied on the Aviation Operations Level 3 National Diploma 5 years ago. Since completing the course here at East Surrey College they have progressed either on to Higher Education or are in employment within the Aviation industry. Joe West, 22, was employed by GAL (Gatwick Airport Limited) after finishing his course at ESC and worked in security. He has since moved on to working in the Resources and HR team as a Resources Scheduler. Joe said that he found that the course really helped with his application and interview as he already had work experience and a good knowledge of the industry. He also commented that when you apply for a job your application form needs to stand out from the crowd and show that the employer should invite you in for an interview. He said that this course gives you the range of skills that will prove that you’re capable for the job. Andrew Bolton, 22, works for Handling Agent Swissport at Gatwick Airport as a Systems Controller within Airport Operations. He is also currently taking flying lessons as he would like to be a pilot. He really enjoys his job and he loves the buzz of working in an airport. Andrea Bishop, 22, worked in a Ground Handling role at Gatwick Airport before progressing onto Higher Education to study for an Aviation Management degree. Since her first interview at East Surrey College Andrea’s ambition has been to run Gatwick Airport. Completing the Aviation course at ESC has given her the skills she needed to progress and move towards this dream. Joe, Andrea and Andrew spoke to the current Aviation Year 1 and Year 2 students to give them the benefit of their experiences. Andrea gave the students the following advice. Good grades at college can also help you save money if you decide to progress onto Higher Education. Andrea applied and received a scholarship to help her financially with her degree at university.